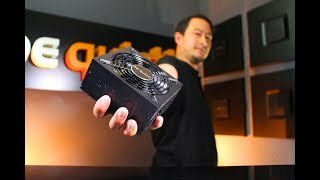 SFX L Power | 500W silent compact Power supplies from be quiet! be quiet! SFX L Power 500W is especially recommended for mini ITX PCs and compact gaming systems. For compact PC systems that perform beyond the ordinary, with an ideal combination of features, power, efficiency and reliability, choose SFX L Power 500W. The SFX L Power supplies CPUs and GPUs with steady and dependable power thanks to a stable 12V-rail, high quality Japanese capacitors and innovative technologies such as LLC, Synchronous Rectifier and DC-to-DC conversion. Four PCIe connectors to support multi-GPU setups. This PSU is perfect for compact gaming PC or HTPC users who are looking for an SFX PSU that is fitted with a 120mm fan. This model includes a temperature-controlled fan. The SFX L Power was built to be very silent thanks to the fan technology used and it produces little wasted heat. SFX L Power 500W is certified 80 PLUS Gold with an efficiency rating of up to 92% – a truly outstanding level for this class of PSU. The most compelling benefit: lower power consumption and consequently lower costs with cooler and quieter operation. Entirely modular cable management is enhanced by premium black flat cables. This simplifies the installation and keeps the system tidy. This power supply is particularly versatile in deployment thanks to the SFX-to-ATX adapter bracket provided. Not only does it fit into cases with an SFX form factor, but can also be installed in a few simple steps into larger ATX cases. You are already using a be quiet! 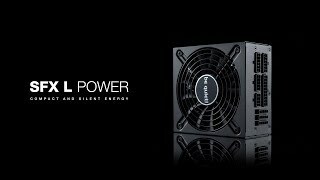 power supply and want to upgrade your system with a new SFX L Power | 500W ? Check here which cables are compatible and don't need to be replaced.